By default all Admin-level users will receive time off requests from employee. Most likely this will not fit your company's workflow so you will want to change it. Direct manager - By default set to "No". Direct managers are based on company Org chart & this setting is dynamic, based on whoever is set as direct manager in the org chart. This is useful if you have strict org chart structure. Read how to set up your Org Chart here. Team manager - By default set to "No". Team managers are based on your team settings. Employee can be in only one team but there can be multiple managers per team, in which case all team managers will receive time off requests. Individual approvers - By default it's blank. 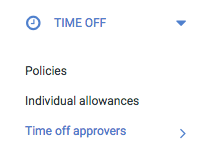 You can assign specific employee to receive time off requests. You can add multiple employees & they can be anyone from the company. These employees will be able to approve time off requests but will not have access to any other personal information. To edit this information, click on "Edit" (pencil) button next to each employee.